I started my writing hobby with a Star Trek satire in 1971. I bought a Royal portable typewriter to write letters home, and decided to take a stab at writing a book. I’d been reading voraciously at the time, particularly Doc Savage, Ron Goulart, and anything by Andre Norton and her alter ego Andrew North. I’d been exposed to plenty of Edgar Rice Burrows’ Dane Thorson on Mars books as well as The Hardy Boys, Nancy Drew and Tom Swift and others I can’t remember. The recurring theme at the time was that they were all science fiction. The only thing I could think to write about was Star Trek, so I came up with the brilliant idea to write a Star Trek episode, which turned out to be a satire. I got a page and a half and gave up. That was the end of my writing “career” until I actually learned to put a proper sentence together in the mid 80’s in Spain when I took a college English class. Soon after, I was able to utilize those skills when my boss taught me how to write the Nazi way. Since I was a supervisor of several people, I had to write performance reports on them and he refused to write them for me. One day, he made me stay after work to write one, and wouldn’t let me leave until I got it right. I’d had that one college English class but that was it. I guess I’d absorbed enough to get me started. The problem with this rather unpleasant evening was that we lived in a place called Eurovillas, a little pueblo about 30 miles from the base. We didn’t have a telephone and at the time, only one car. My wife had no way of knowing if I was okay or if I’d fallen asleep at the wheel or something. I had that pressure on me as I reworked and reworked each sentence of that performance report. I’ll say that session left an impression! From then on, I became a much better writer and in fact, I became somewhat of an expert. Before I knew it, other people were coming to me, instead of the other way around. I’d never been real fond of English because of an incident in 4th grade English class. It was at the height of the cold war when we were still doing drills where we had to dive under our desks in case a nuke went off! One day, our teacher at Clarence Ruth Elementary School in Lompoc, California was talking about nuclear energy and he held up our English book. He said that there was enough energy in our book that if it was released all at once, it could destroy the world. From that day on, I never liked English class and never liked writing until many years later. It wasn’t until almost a decade after the Nazi writing incident when that old feeling came back again. With the advent of computers and word processors instead of the old typewriter, I sat down with Enable OA, the hottest word processor at the time, and started in on my first full-length novel. The Cave was the result. Though I now had the skills to write coherent English and the structure to put these sentences together in a coherent way, I had no clue how to make a commercially viable novel. The Cave was a way to exercise my chops and I learned a lot from that, but it was done in isolation. In Altus Oklahoma, there was no writer’s group, nobody I could talk with to guide me. Today, The Cave languishes in my electronic file as a learning experience. Soon after that, as I took up writing my second novel, The Greenhouse, I met a wonderful lady, Carol Davis Luce. She has become a lifelong friend and mentor. More on her in other parts of this web site. Though I have written a few other sci-fi short stories, one finally saw publication in 2008. 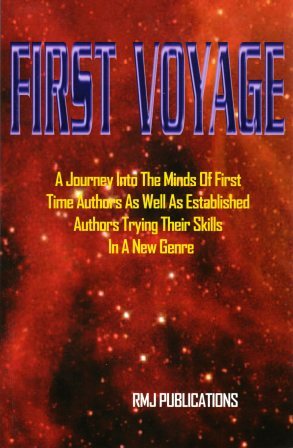 Fun In The Outland was chosen to be part of sci-fi anthology First Voyage, published by RMJ Publications. The cover is featured below. Fun In The Outland is told with my usual humor and is the story of a man sent to a planet to recover some used equipment from a mining site. He is set up by his employer because the residents are extremely sensitive and looking for a fight. Our hero unintentionally starts an intergalactic war. One day I may write another sci-fi novel, but right now, my plate is full. I started one last year, but had to put it on hold due to other projects. The premise involves passing between alternate worlds and I was chugging along pretty good until I saw that the TV show Fringe was doing the same thing! My story is completely different, but still… Maybe someday I’ll pick it up again if I get inspired. I still keep thinking of resurrecting that alternate world story now and then. I think I could make it work. Time is my enemy right now. The only thing that might change that is if the muse strikes me. That will take precedence over everything else. We’ll see. Wow! We also had cold war drills. I was attending Polkville Elementary School. A very small school located in western North Carolina, in the town of Polkville, at a crossroad with one stop light. The year was 1963, and we learned that if a nuclear bomb hit outside in the school yard, all we had to do was get under our desk. If we were at home, we would put a sheet over our head, and get under the kitchen table. Our training really intensified during the Cuban missile crisis. Polkville was named after President James K. Polk, and it still has only one stopiight. The school has long since been torn down. I have some of the old bricks from the school. I really loved the old episodes of Star Trek….and still watch them. It would be great to have the entire DVD collection. I think that our good friend, James Mullaney has them…seems that he received them for a Christmas present. I have all of the episodes in paper back, stored in a Bass Weejun shoe box. Very appropriate as both were from the 60’s. They were always my favorites. I liked most of the new versions except the last ones with Scott Bakula. The originals just had something about them that could never be duplicated. Beam me up!